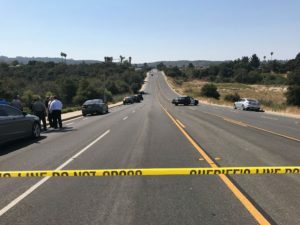 A Santa Barbara County Sheriff’s deputy shot and killed a Nipomo man who was fleeing after allegedly robbing a Coast Hills Credit Union at knifepoint in Orcutt. On Tuesday morning, deputies arrived at the Coast Hills Credit Union in the 1100 block of Clark Avenue, where a robbery was reportedly underway. Deputies spotted Robert Earl Adams, 30, running down a hill toward the 5100 block of Bradley Road in an area commonly known as the Bradley Dip. One deputy found Adams and then shot him. The shooting took place within three minutes of the deputies’ initial response to the robbery, according to the sheriff’s office. Deputies administered immediate medical care, and Adams was transported by an ambulance to a local hospital where he died of his injuries. The sheriff’s office has not release further details about the moments leading up to the shooting. Santa Barbara County’s coroner is conducting an investigation to determine Adams’ official cause and manner of death. A toxicology report and lab results are pending. Sheriff’s officials say authorities recovered the exact amount of money stolen during the robbery when they searched Adams’ wallet at the scene of the shooting. Adams was involved in a crime spree in the hours leading up to the robbery, according to the sheriff’s office. On Monday night, Adams was involved in several felonies in the Nipomo area, including assault with a deadly weapon and attempted robbery and/or auto theft at the group home where he had been living, according to the sheriff’s office. Adams fled the area in a vehicle that was stolen from the neighborhood. Authorities later located the vehicle, which they say had been crashed and abandoned. The deputy involved in the shooting has been placed on administrative leave. Both the Santa Barbara sheriff’s and district attorney’s offices will conduct investigations into the shooting. Personnel responsibility. When one makes choices and one lives with the consequences. Guess who the one is here?? or dies with the consequences in this case. Job well done. Sheriff did the right thing….case closed. Justice was served deliberately and competently. Let that be a warning to those who choose to break the law. If we had heard he robbed a bank with a knife then “allegedly” charged deputy’s, there’d always be a certain few charging ahead with chants of “excessive force” and so forth. However, after reading what a train wreck this man was living for the previous 24 hours I feel like HE would have probably killed someone eventually. Darned shame either way!